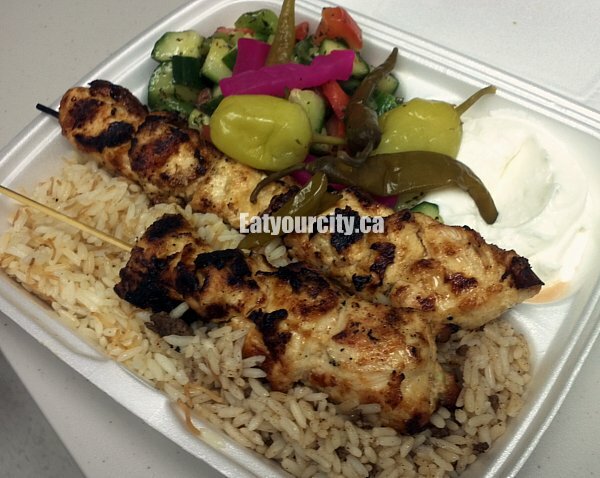 Eat Your City: La Shish Taouk Edmonton, AB - Tasty Lebanese hummus, garlic sauce and chicken skewers! La Shish Taouk Edmonton, AB - Tasty Lebanese hummus, garlic sauce and chicken skewers! After switching ownership a while back, the recipes got tweaked a bit - the garlic sauce isn't as garlicy or lemony, and the chicken skewers aren't as well seasoned... BUT, its still a great late night place to stop by to grab some tasty Lebanese fare whenever that craving hits. Whether you do the cafeteria style sit down or take out, its one of my favorite places for hummus. I know, its "just" garlic, fresh lemon juice, chickpeas and some tahini (stoneground sesame paste)... but its soooo wonderful with fresh pitas from Sunbake Bakery (the hummus order usually only comes with one piece of steamed warm pita, but nowhere near enough to adequately dunk into a big container of hummus. Mmm.. Hummus. Oh yes, the hummus... fragrant with garlic, its almost velvety texture makes it wonderful to dunk chunks of pita bread or fresh veges like baby carrots or sweet bell pepper slices into when you get home. The fresh lemon juice gives it a touch of acidity, while the small pool of extra virgin olive oil on top (I stirred it in before taking the pic) adds in creaminess and the olives (I ate them sorry lol!) some salty olive goodness. Its smooth, its garlicy, its HUMMUS!!! 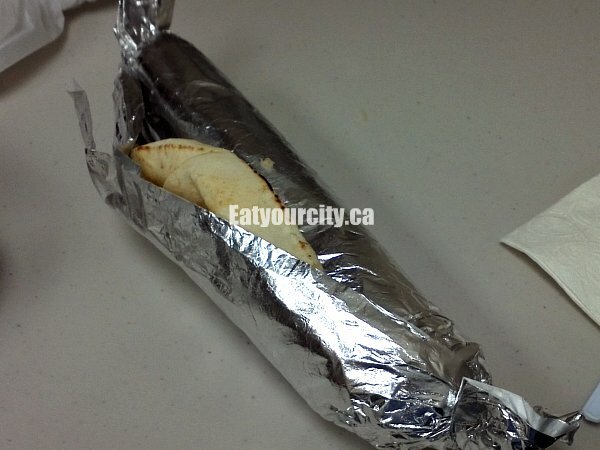 The order of hummus comes with usually 1 piece of pita - heated up and rolled in a foil wrapper. One piece of pita and like a cup of hummus? Not that I'm complaining about the cup of yummy hummus... but why only 1 piece of pita? I always have to hit up Sunbake Pita to pick up enough fresh pita to use up the hummus. Yeah, I could dunk fresh veges in when I have them kicking around in my fridge, but fresh soft fluffy pita and this hummus... mmmmm! Aside from the hookahs you can order (flavored water pipes) only available at the West end location, not the downtown location, there's lots to choose from - Chicken shawarma, beef, lamb and chicken kababs, falafels and combo plates. My fav is the Chicken Shish Taouk platter. Seasoned chicken breast cubes grilled to perfection on top of 2 types of fried rice. One type of rice usually has some bits of seasoned ground beef in it, while the other one has some Chinese noodles stir fried into it. It also comes with a cucumber and bell pepper salad drenched in a herb dressing, a little container of hummus or garlic sauce (your choice) and pickled vegetables. Midnight craving bliss. The verdict? Great late night Lebanese food and awesome chicken skewers! Great little place on Jasper. I find the service is much friendlier (and possibly faster too) with the new owners.